The environment that surrounds you at work is culture. You might not be able to see it, but know it is there. Successful leaders are careful to spend time thinking about how to encourage employee contributions to workplace culture. Alumni from Presidio Graduate School (PGS) launched Culture Bites, a start-up to help companies have these conversations. Culture Bites is there to help companies develop their team culture. 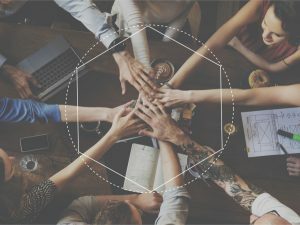 It is based on the belief that teams already have the answers to the question of how to build a flourishing culture, but need the lasting support to nurture team growth. Culture Bites was the Social Entrepreneurship capstone of Tegan Molloy, Rob Goehrke and Dave Bergart. “We have seen that implementing bite-sized change is much more manageable for teams. It also accumulates over time, making it way more effective than a grand one-time gesture,” says co-founder Rob Goehrke. Tools from Culture Bites open the door for deeper listening amongst teams, “One of our key design principles is to create an environment where everyone has a chance to be heard. Inviting all-voices into the fold, make for more resilient teams,” says co-founder, Tegan Molloy. “The design principles baked into our product are what we aspire to practice on our team.” Teams can order a monthly or quarterly subscription box. 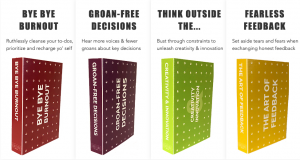 Each box comes with four 15-minute activities that are fun and easy to incorporate into existing staff meetings or retreats. Typical customers for Culture Bites include entry-level managers to C-Suite executives, small business owners, Human Resources professionals, and non-profit executives interested in developing team culture. Culture Bites listens to their customers and their team, “Our team is our biggest asset. We try our best to take everything we learned at PGS and implement it,” says Goehrke. Recently, part of the Culture Bites team took the Creativity and Innovation course at PGS. Using principles they learned in the class; they redesigned the Culture Bites box with their customers in mind. “Watching customers responses, whether they furrow the brow or smile, was how we took the customer experience to the next level,” explained Goehrke. The Culture Bites team all miss the excitement of being in class and learning. They see their work as a way to extend that experience.